After interviewing more than eight hundred people, I agreed to give my first interview – conducted by Tim Rich for the debut issue of Random Spectacular, published this week by St Jude’s in aid of Maggie’s Centres. Described as a collaborative exploration of the visual arts, the magazine includes work by Spitalfields Life regulars Paul Bommer, Joanna Moore and Rob Ryan among many others. 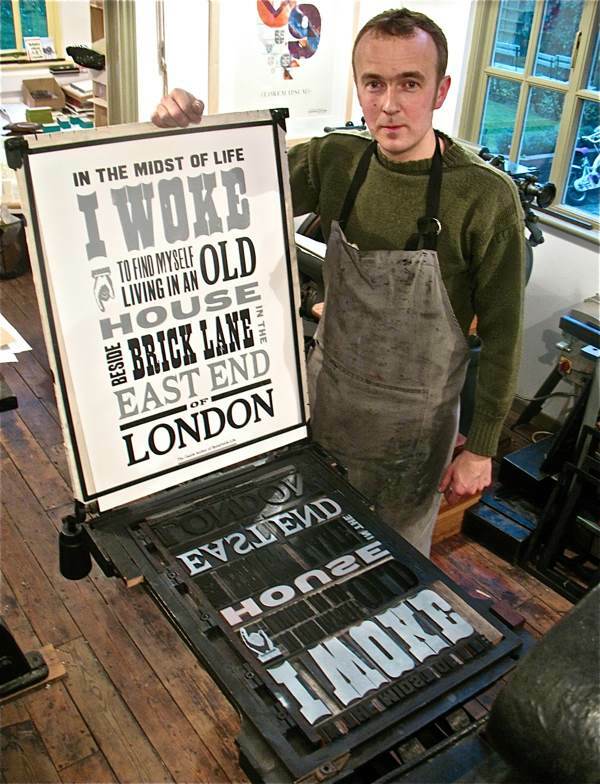 Justin Knopp of Typoretum was commissioned to create a print to accompany my interview and so I took the opportunity to travel by train from Liverpool St to Coggeshall to visit him in his workshop. I had not met Justin Knopp of Typoretum before he designed the print you see him holding in this photograph – I had not even spoken with him – yet when a copy arrived out of the blue, I was so impressed that I got on the train up to Coggeshall at once, eager to go and find the man behind this clever piece of typography. Situated where the suburbs of Essex have unravelled into green fields and villages with old flint churches, Coggeshall is an ancient market town lined with medieval houses upon Stane St, the Roman road which is the continuation of Old St. Outlying the village, behind a modest nineteenth century terrace, you will find a long weatherboarded shed with a plume of blue smoke drifting through the orchard from the chimney of the wood-burning stove within. 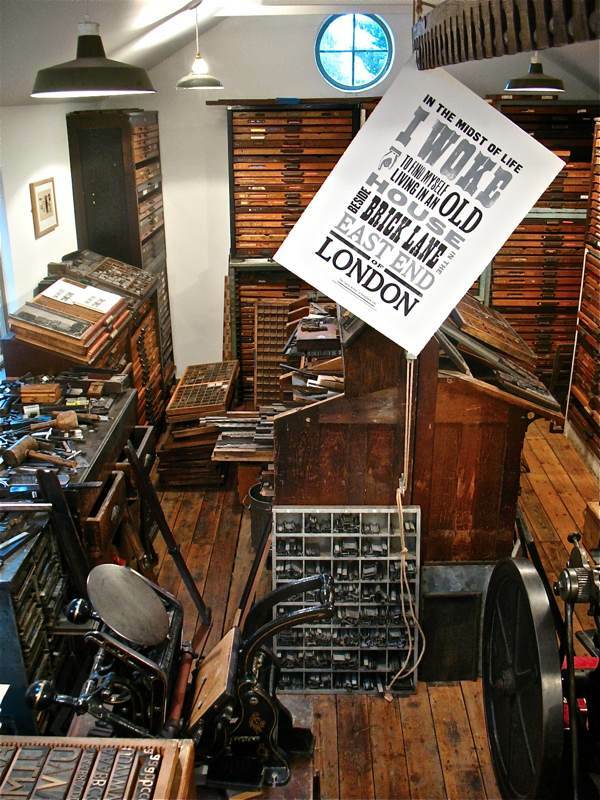 Here, in a single long room lined with trays of magnificent wooden type and filled with gleaming iron printing presses crouching like tamed mythical beasts, Justin Knopp – printer, typographer and retained fireman – works his subtle magic. Justin was born in Coggeshall though he studied in London at St Martin’s College of Art in Covent Garden before returning after graduation in 1994. “My family are all from London for generations,” he told me as he started blending ink with a palette knife upon a glass plate, “before that they were from round here, Maldon. They were bootmakers.” And then he went silent, assuming the grimace of concentration upon the task in hand. 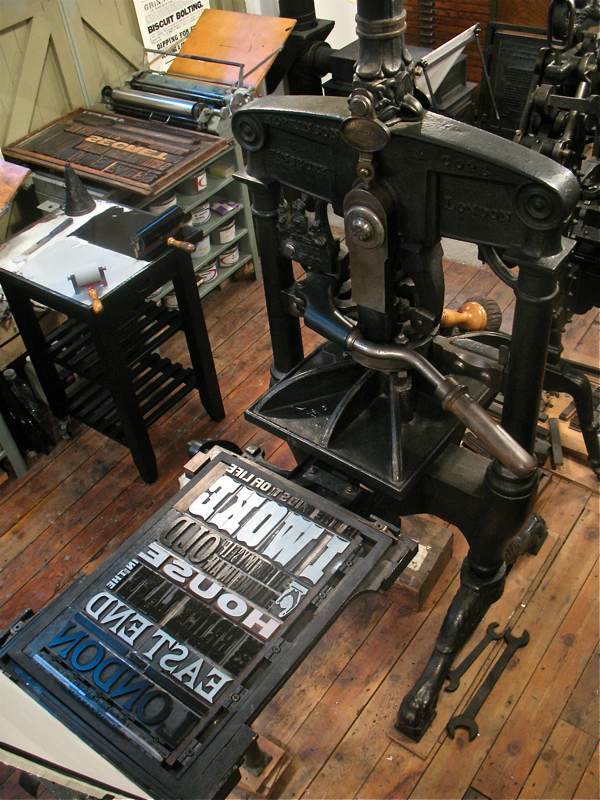 Meanwhile, the printer’s pie sat upon the Albion Press of 1851 awaiting the ink and I could not fail to be impressed that although Justin had used a different typeface for each line, all the lines were of equal length. 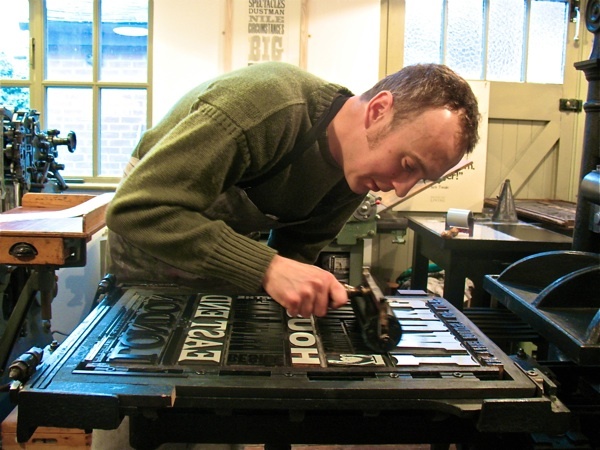 “I like the challenge of fitting the type into the block,” he explained, observing my interest, “It certainly makes life difficult, but it’s a bit of a house style of mine!” After years of commuting and working as a graphic designer in London while pursuing letterpress as a hobbyist, Justin took the brave step of starting out on his own in 2009. He built the shed, installed the presses and never looked back. 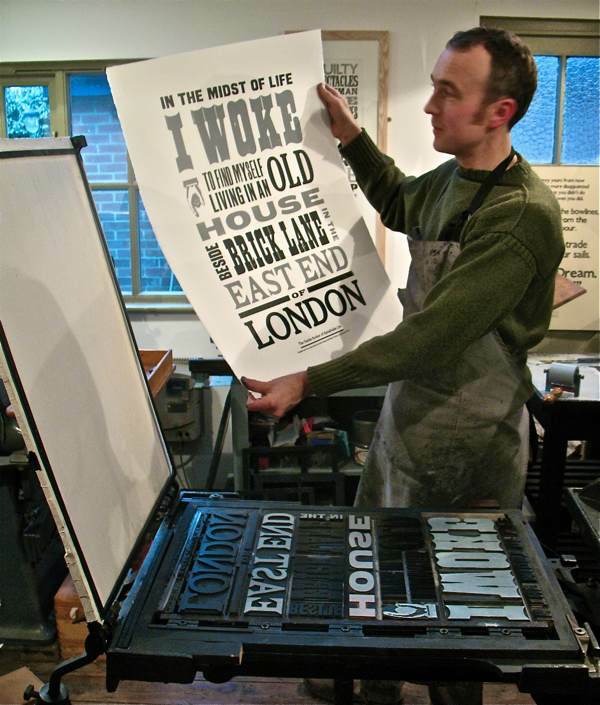 “I started doing this because I loved it and I knew lots of the old boys that were doing it” he confided to me as he began to roll the ink onto the type, “and I thought, ‘It’s dying out and that’s a terrible shame,’ so it became my ambition to carry it on.” In fact, Justin’s school playground sat beside The Anchor Press, one of the largest printing factories in the country at the time and although it is long gone, Justin befriended many of the veterans of the printworks, recording the oral history and archiving the photographic record. The outcome of this passion was that Justin was gifted collections of type and presses that he has supplemented with his own acquisitions. Bringing a contemporary sensibility to the use of these classic typefaces, Justin finds himself in demand, not just for business cards and wedding invitations, but providing fine letterpress printing for all kinds of projects such as the recent limited edition of Haruki Murakami’s “1Q84.” “Lots of weird and wonderful things we get involved with,” admitted Justin with a delighted smile, as he laid the paper down delicately upon the type, placing the packing on top and rolling the whole contraption forward beneath the press before pulling upon the lever and leaning back with his whole weight. 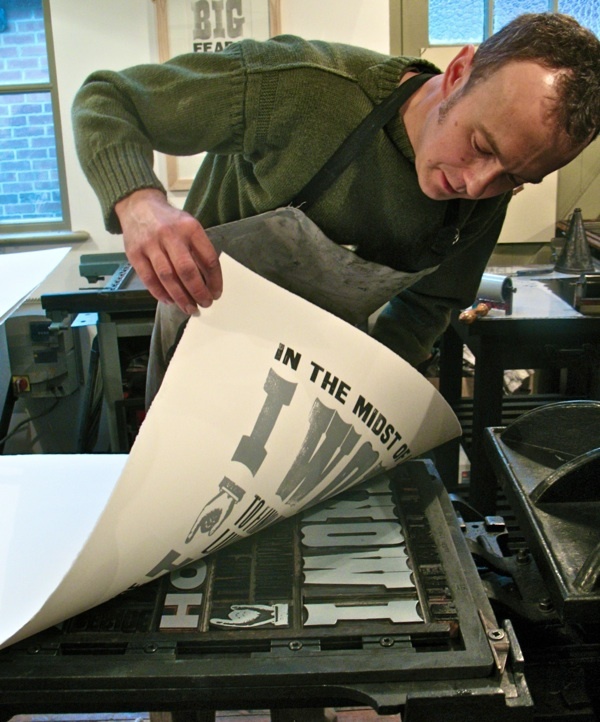 “I like a degree of imperfection,” he confessed, scrutinising the resulting print with a frown, “but any more than that and it looks badly printed.” Justin is scrupulous to achieve what he terms, the “kiss” impression that sits upon the surface of the paper, not the indented imprint that is commonly associated with letterpress yet merely an indicator of poor quality printing. The truth is that the print looked mighty fine to me, an enormous thrill to see my words emblazoned in such style. 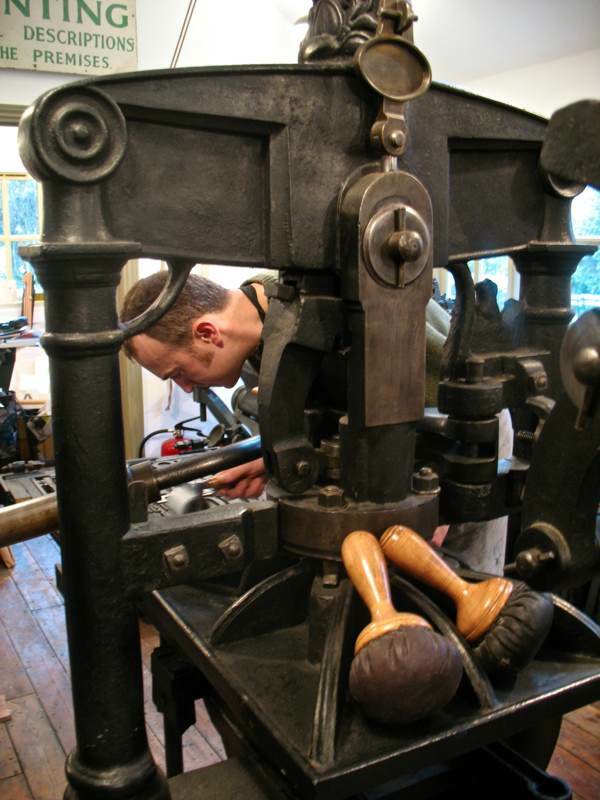 Working assiduously in his Guernsey sweater and canvas apron, surrounded by nineteenth century presses and bringing new life to old techniques, Justin is a happy man. He is at home here, with a busy family life and an active involvement in village life that includes firefighting duties too. “I’ve gone from doing it purely for the love of it to making a living out of it, and we’re still alive!” he declared to me, casting his eyes around his beautiful print workshop in triumph. 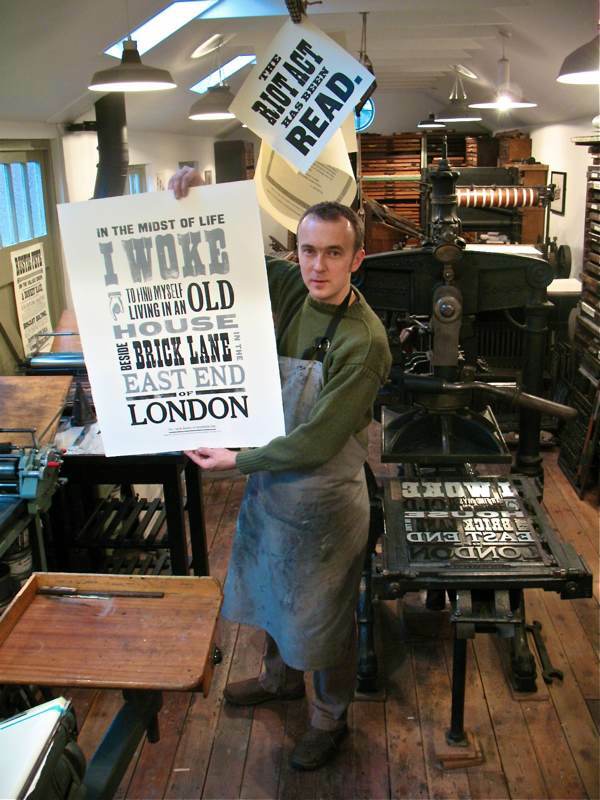 Copies of Justin Knopp’s print are available from the Spitalfields Life online shop and copies of Random Spectacular magazine will be available from St Jude’s. This looks amazing! And so well done too. 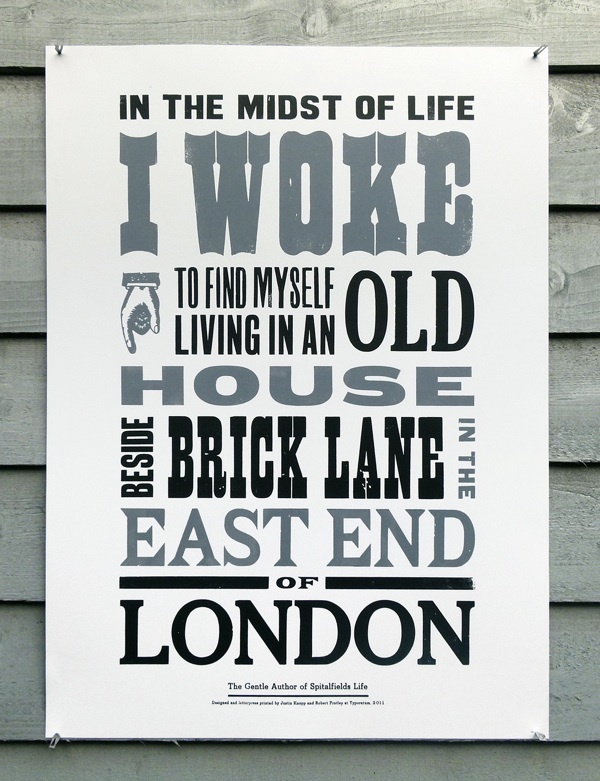 Its very clever the way it all fits together so well, with the ‘BESIDE’ beside and the ‘I WOKE’ loud as a blaring klaxon! I love it! Oh how interesting! I grew up in Coggeshall as well so this made me feel really homesick! I love old fashioned type setting so will definitely be checking out Justin’s work. Glorious work. I absolutely love typography. 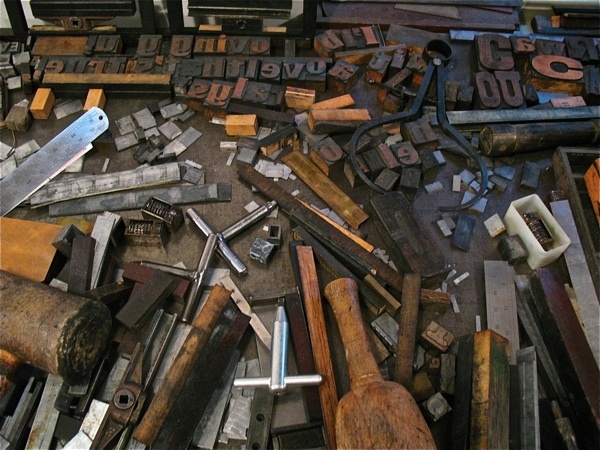 PBS did a great documentary called Typeface that focuses on the Hamilton Wood shop in Two Rivers, Wisconsin. I am so very happy to see that in today’s world, people still embrace typography. It’s beautiful. It is impressive to see how, starting from a very small corner in an old garage turned so professional indeed! Congratulations to you Justin and your great little “elves”Thanks for sharing! Justin you’re a STAR and just wait and see, your mum-in-law’s predictions will come true! Congratulations, and the best of Greek/British for a brilliant future! A lovely portrait of a craftsman and his skillful work. I lived for 15 years at Glazenwood nearby, restoring a derelict property, formerly owned by one of the Kray family, (see the Blog about the twins’ driver). It was a very attractive medieval wool town full of history (including a couple of recent murders) and I remember being shown the small cupboard on the stairs of a very old house where the Dancing Bear was kept. Paycockes is a magnificent Tudor building right on Stane Street and used to be open to the public. You are an absolute credit to your craft, your art and family, ultimate success is just around the corner. PS No pictures of the glamorous engine room team without whom you’d just fade away! An interesting collection of old wood block and equipment. A mixture of old and new with the old Albion chase being locked up with modern Cornerstone quoines (modern being 1960′s). I would be interested to know if Justin has tried inking the forme with the pelt balls. 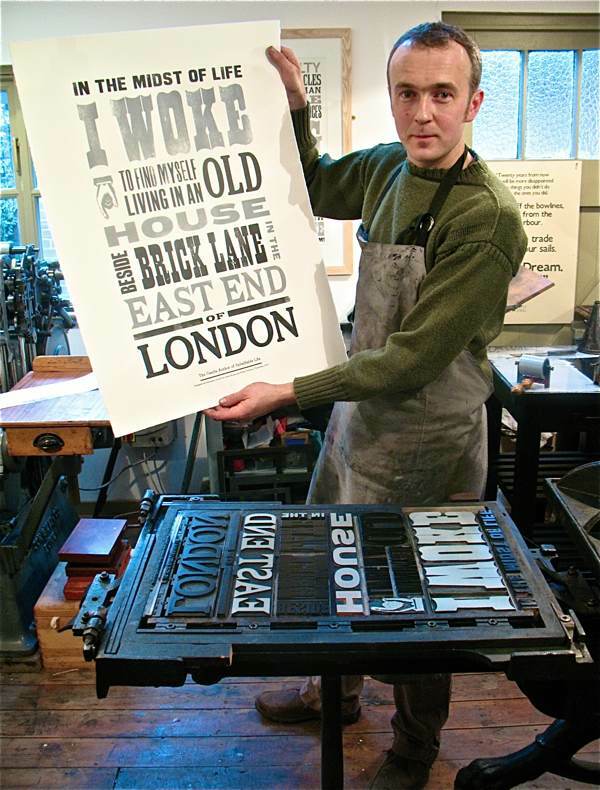 Good luck to Justin, its good to see him getting a living with the old technology and he is a true letterpress man by not letting the impression come through to the back of the sheet. I had no idea how beautiful this type of printing could look. You are a true artist. I should like to see some more. Well done. gorgeous. i have been thinking about the “new” “economy” and artisanal everything is the first thing which springs to mind. i am happy to think he does well by doing good. and, congrats on interviewing 800 people. wow. It is so inspiring that Justin is creating a livelihood with his talent, commitment and enthusiasm, and building a business with Cecilia, who is able to utilise her own skills and experience, to the benefit of the whole family. May his marvellous craftmanship go from strength to strength. Wonderful. 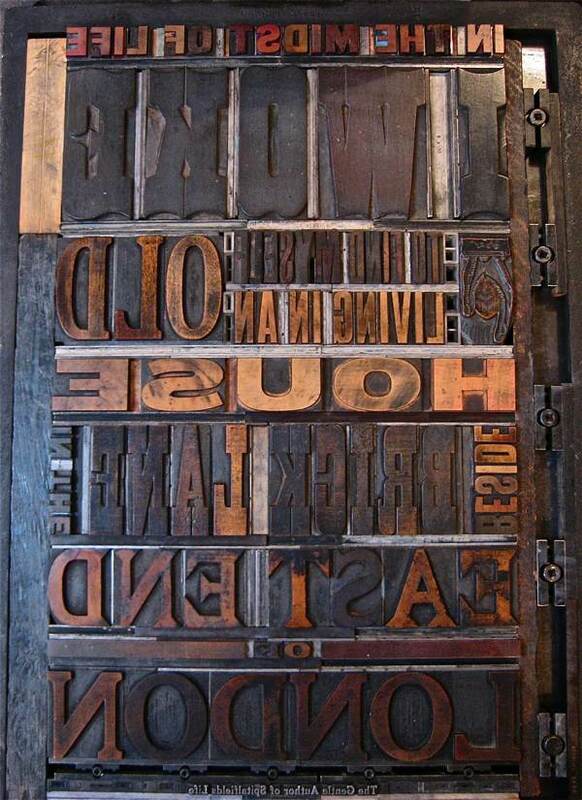 I served my apprenticeship as a compositor using such materials and presses. I t brought back many happy memories, keep up the good work.